Discover What It Really Takes To Succeed And Profit From Your Own Online Business And Find Out The Little Discussed Facts That People Ignore - Or Choose To Ignore - That Makes You Either An Internet Millionaire Or And Internet Failure! * It has NOTHING to do with the ebooks on making money that you ordered. * It has NOTHING to do with the guru you thought you could trust. * It has NOTHING to do with the money-making program you have joined. * It has NOTHING to do with the business you are building. That is really good news! If you see it this way, you have only yourself to blame. The blame cant be placed on the guru next door or the money making programs you joined that are responsible for your misery. 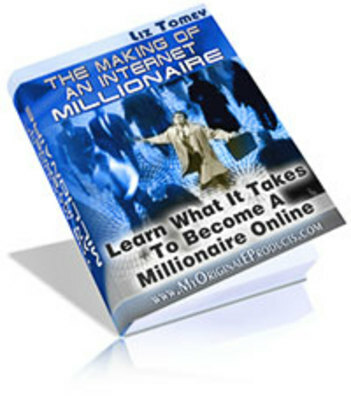 My name is Liz Tomey, and I have written this guide for you as a budding Internet millionaire in the making.